Having grown up on trout waters in the mountains of Virginia, fly rods were the norm for Austin throughout his childhood. That passion grew with age and he ventured west to find the scenic peaks, crystal-clear rivers, and infamous trout that filled his dreams. He began his guiding career in 2004 in the backcountry of Idaho. In 2005, he graduated from the Western Rivers Professional Guide School, and in 2010 from the University of Tennessee with a B.S. in Wildlife and Fisheries Science. As a full-time Pinedale resident, and avid outdoorsman, Austin relishes the opportunity to chase high country mule deer and elk in the fall with family and friends. He has a diverse business background that includes agribusiness, outfitting, and real estate. When not guiding, he works as a Realtor with High Mountain Real Estate in Pinedale, serving all of Sublette County. His true happiness has always been found at the oars, methodically placing anglers of all skill sets in the optimal position for ultimate success. Austin is also an avid fly tyer, that enjoys seeing clients have success on patterns he has personally tied. 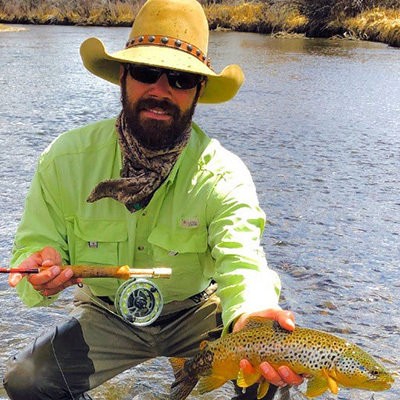 While his true happiness has always revolved around a fly rod, his ultimate passion lies within those magical moments of deception often found while in pursuit of wily brown trout that fill the region.